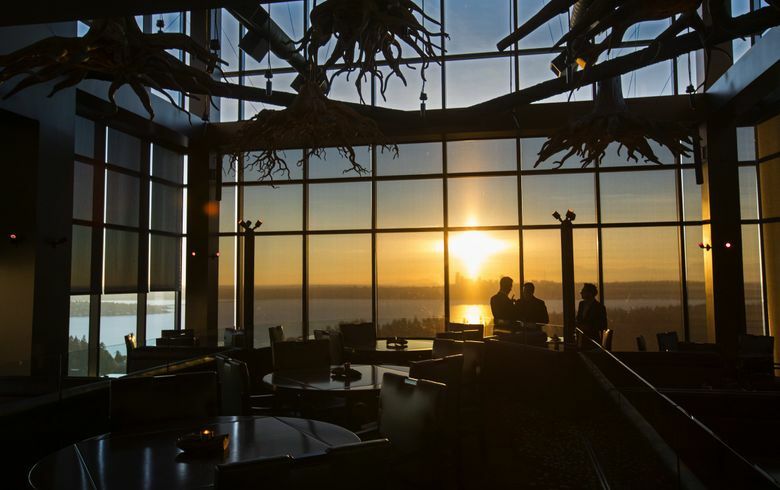 The press release prepared me for the panoramic views, the extravagant décor and the stratospheric prices, but I didn’t expect to be so wowed by the food, writes Seattle Times restaurant critic Providence Cicero. Everything sampled over two visits revealed precision, imagination and a good bit of swagger to boot. 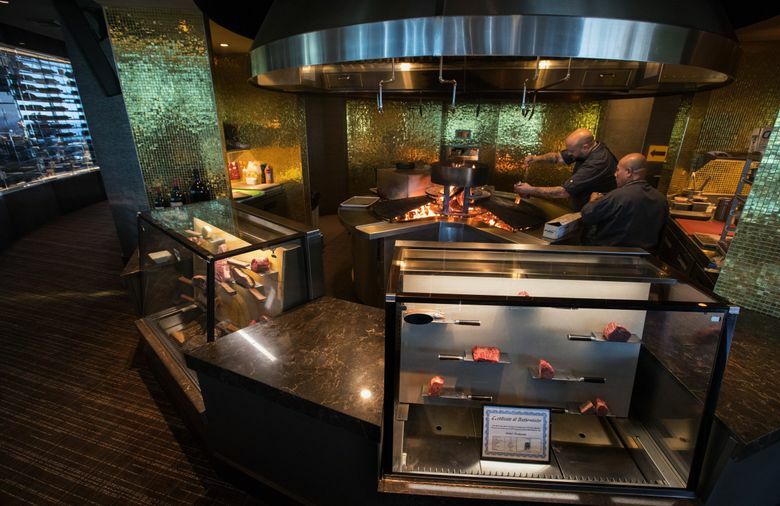 Traditionalists, take note: Ascend Prime Steak & Sushi is a steakhouse with no baked potato on the menu. 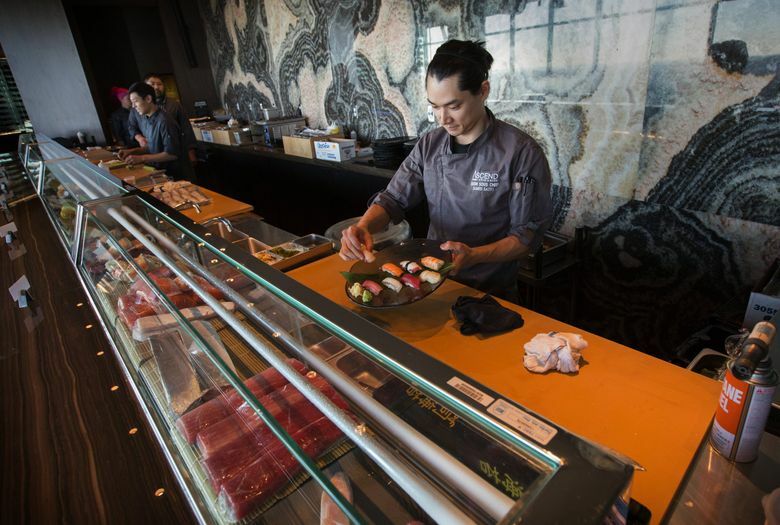 It’s the sort of sushi bar where you’ll find prosciutto in the spicy tuna roll. In other words, expect the unexpected at this swank, glass-walled aerie atop Bellevue’s Lincoln Square South. 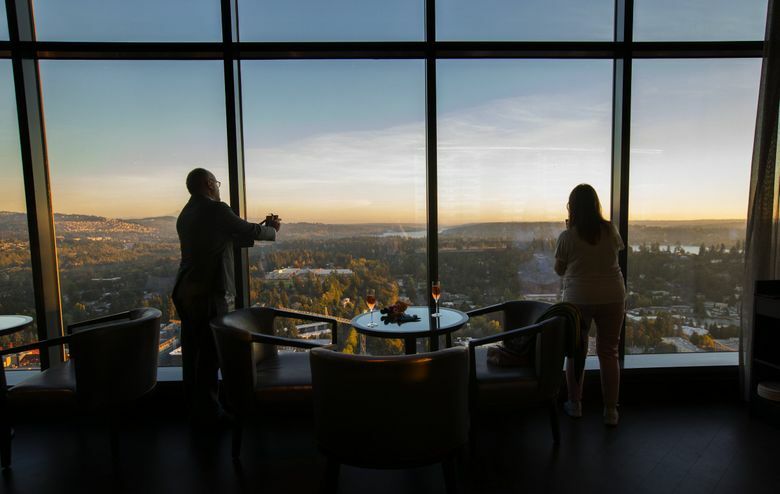 The press release prepared me for the panoramic views, the extravagant decor and the stratospheric prices, but I didn’t expect to be so wowed by the food. 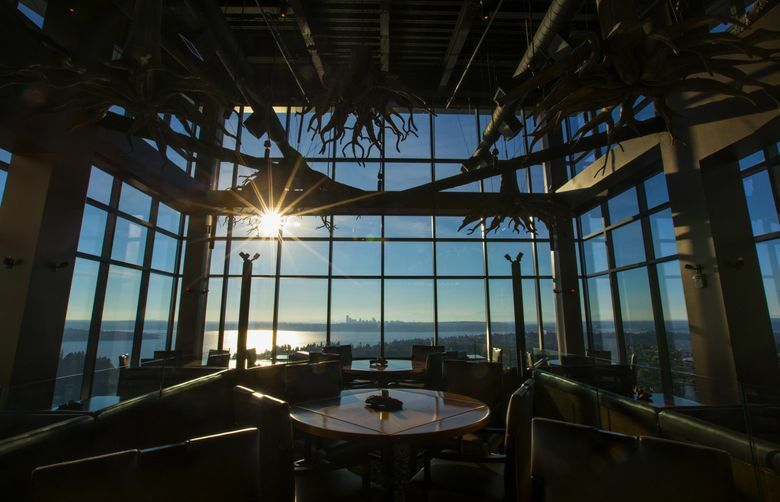 The steaks and sushi alone are worth the ear-popping express elevator ride to the 31st floor, but there’s a lot more to like from land and sea. Everything sampled over two visits — from uni lobster bisque that plumbed unimagined oceanic flavors to the cloud-spewing Skyfall dessert — revealed precision, imagination and a good bit of swagger to boot. Ascend is rich in every sense of the word. The owners — Bellevue couple Elaina and Paul Herber, and Jeffrey Frederick of Elite Brand Hospitality Group in Las Vegas — are also the people behind the multicultural food hall that you pass through to begin your ascent to the rarefied world of Ascend, where a carved wooden basin between the sinks in the ladies’ room holds a Hawaiian sea-salt scrub to exfoliate and moisturize your hands. 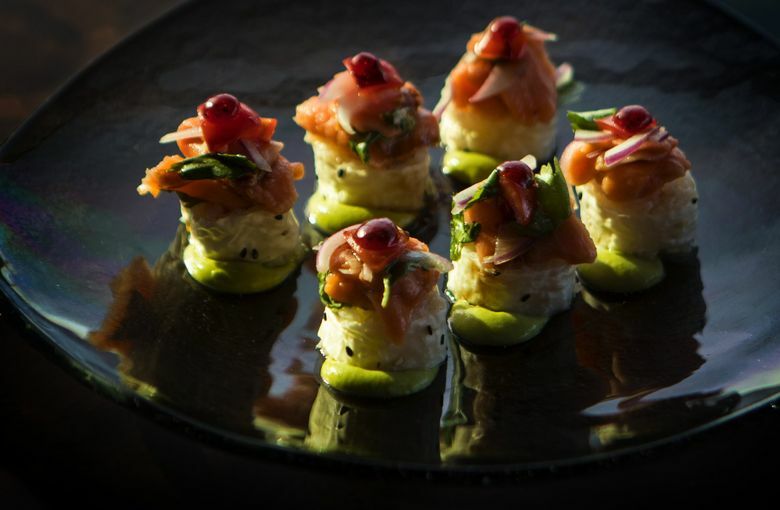 On the way to your table, you’ll pass the granite-clad sushi bar where seafood is arranged as meticulously as jewelry at Cartier. The host may take you the scenic route, up a curved ramp alongside a glass wall holding hundreds of wine bottles, past a butcher case showcasing cuts of raw meat on horizontal cleavers that act as shelves. Behind it is the grill kitchen, a circular, gold-tiled arena where four cooks tame leaping flames fed by five native woods: white oak and apple for the beef; alder, pear and apricot to cook fish and game. Replicas of those five trees’ gnarly root systems hover high above the west-facing dining room. After dark, their reflection in the tall paned windows is eerily stunning. It looks like a penthouse for gnomes. The beef offered, in ascending order of price, are USDA prime, Mishima Reserve domestic wagyu, Australian Tajima wagyu and, from Japan, A5 Kuroge Breed and Miyazaki Prefecture wagyu. All steaks are seasoned with kosher salt, basted with red-wine-shallot butter, and finished with black-garlic butter and freshly ground sarawak peppercorns, a mellow Malaysian variety. The luxuriously textured Kuroge filet mignon, served as thinly sliced as sashimi, needs no further embellishment than that. Imported beef is priced by the ounce; three ounces (the minimum required) of Kuroge cost $90. 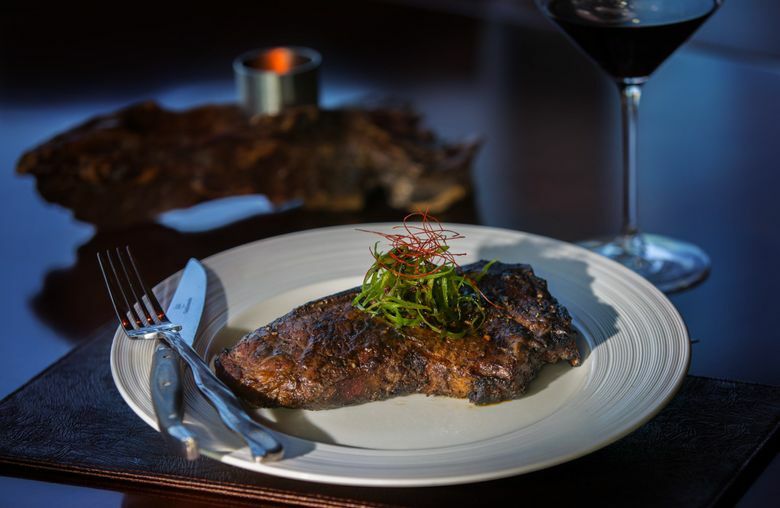 For something less precious, try the 17-ounce, bone-in, prime New York strip, dry-aged for 45 days. It has a beefier taste and more chew and delivers everything a steak purist could ask for. Moreover, at $76, it seems like a bargain in this realm, though a rosette garnish of slivered spring onion and shishito pepper is the only accompaniment to any of the steaks. If you’re inclined to embellish with a sauce, make it the velvety, marrow-flecked, shiro dashi bordelaise. Other meat and fish mains had a team of support sauces. Rainier-cherry gastrique, coffee-infused demi-glace and spruce pesto swerved across a plate of remarkably tender, guanciale-wrapped venison medallions. Crisp-skinned chinook, which they will cook to your preferred doneness, came with three harmonious purées — black garlic, celery root and mint — plus charred lemon, its cut side dipped in spicy shichimi togarashi. 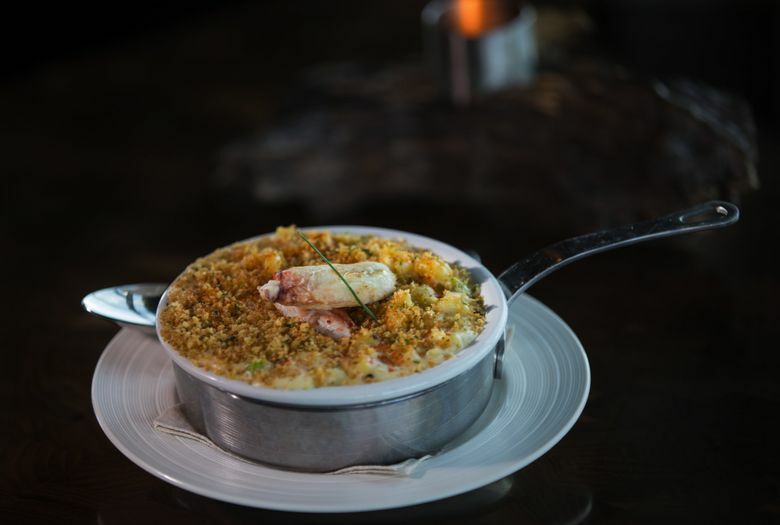 Shichimi gave a gentle kick to the blend of Parmigiano-Reggiano, emmenthal and white cheddar in edamame-studded Dungeness crab mac and cheese. That side dish and others are designed for sharing. A platter of grilled and braised vegetables rounded up more than the usual suspects; it had asparagus and zucchini but also lotus root, daikon sprouts and bamboo shoots amid a confluence of veal demi-glace, koji (a fermenting agent) and rayu (chile crisp). Ponzu aioli, foie gras and a few tempura-fried mushrooms transformed a somber wild mushrooms sauté into the life of the dinner party. 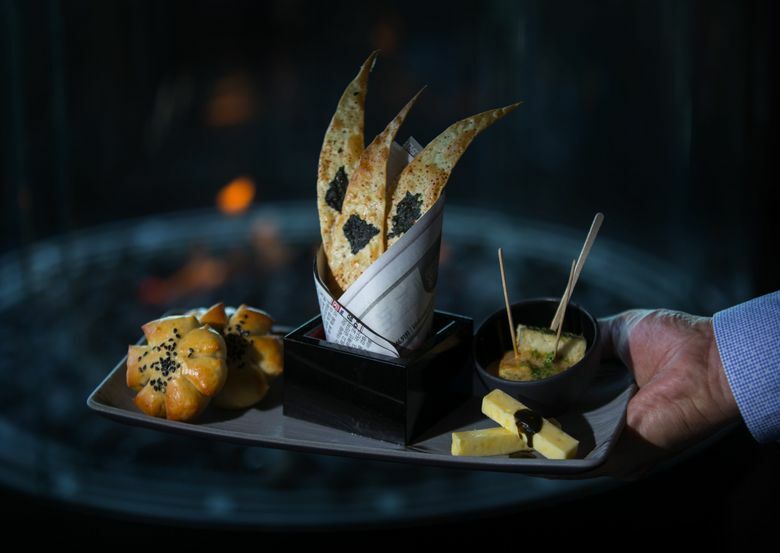 That party kicks off with a bread service that doubles as an amuse bouche: bites of agedashi tofu come with warm adzuki buns and savory nori crackers. For an auspicious opening act, consider braised Kurobuta pork belly nearly submerged in truffled tongotsu broth. It’s a posh version of ramen with arugula-filled agnolotti and a soy-poached quail egg. The amazing uni lobster bisque is poured into a bowl at the table, setting afloat a lily-pad-like arrangement of lobster meat, roe, avocado, ginger shoots and brandy-kissed crème fraîche. 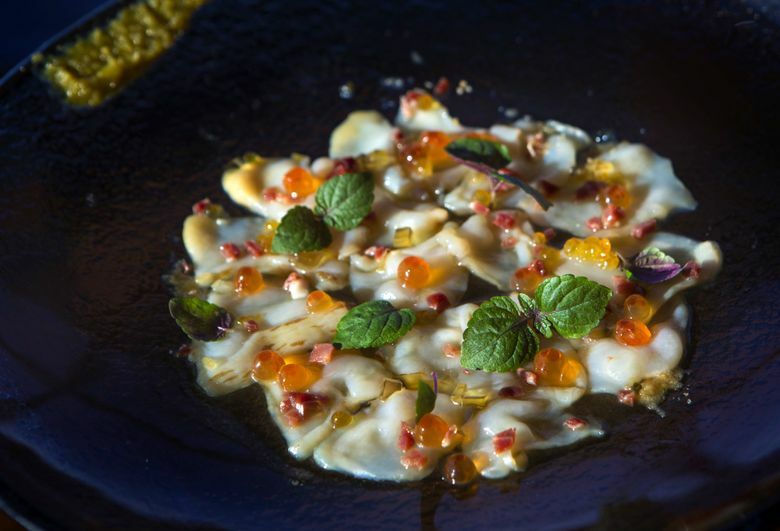 Geoduck crudo, as pretty as a night-blooming cactus flower, is a lighter choice. Smoked trout roe, dashi gelée and finely diced Iberico ham provide scintillating contrast to the translucent ivory petals of raw clam. Sushi or sashimi are good opening gambits as well. Sushi chefs Yuki Ieto, late of Miami’s hip Pubbelly Sushi empire, and James Saito, who worked with Seattle’s own Shiro Kashiba and Taichi Kitamura, skillfully fashion classic nigiri along with contemporary whimsies like that spicy tuna roll, which not only has prosciutto but also shaved bottarga (cured fish roe) and little beads of bubu arare (rice cracker) that add crazy crunch to each bite. 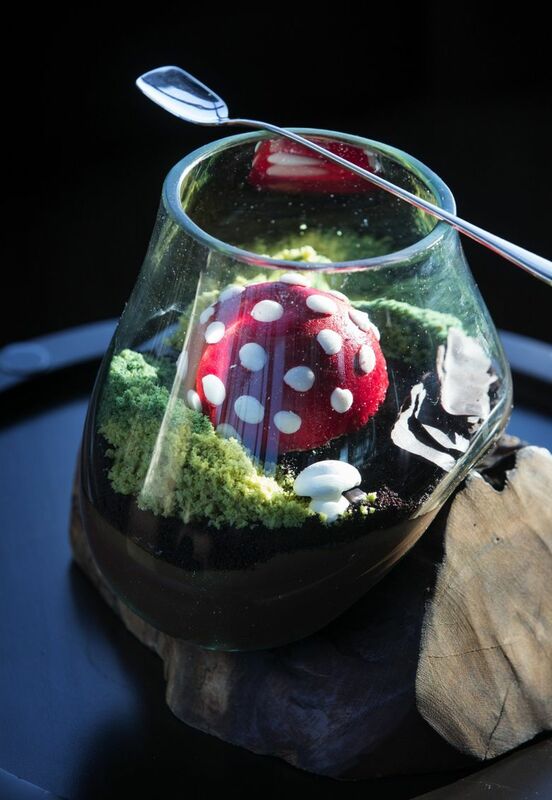 Pastry chef Marta Eimer’s desserts are the ultimate flights of fancy here. When Skyfall’s dry-ice cloud dissipates, you find goat-cheese panna cotta, blueberry macarons, fresh berries and other accents that tiptoe between sweet and savory. 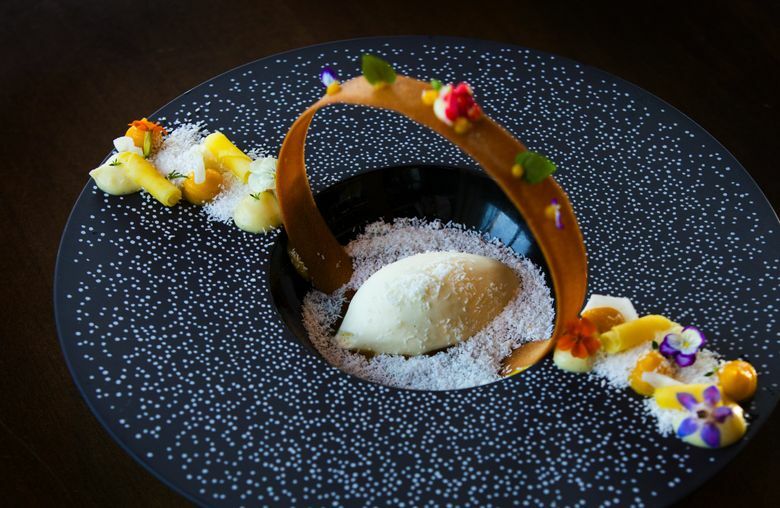 “Halo” goes unabashedly tropical with a flower-adorned corona of vanilla tuile arching over a coconut-showered lagoon of mango curd, passion-fruit caramel and coconut ice cream. It takes a huge team to run a restaurant of this size (total capacity 450, including private dining rooms). Culinary director Kevin Hee (Gordon Ramsay Steak, Las Vegas), executive chef Sean Mayhew (Gordon Ramsay Pub & Grill at Caesars Palace), and executive sous chef and Seattleite Derek Bugge (2120 and 99 Park) head a kitchen crew of 46. The front of the house staff numbers nearly 100. In this luxury league, customers rightly expect a high level of attention to detail. On one visit, our lead server was visibly nervous, fudged his answers to some food questions and delivered the check in the middle of dessert. Another time, service was flawless, both at the table and in the busy lounge, where we waited half an hour past our reservation time but were constantly checked on and even offered a glass of bubbly. Had we accepted that offer, no doubt we’d have been given the $12 Italian sparkler, not the Cristal Brut 2009 ($87 by the glass/$348 a bottle). Scrolling through beverage director Brandon Rastok’s list (it’s on an iPad), I counted dozens of bubblies, 22 of them champagne, not surprising in this milieu. Nor is the emphasis on reds, and the mostly mainstream Northwest, California and European varietals. Who goes to Ascend? Trendsetters and gawkers alike plus, I imagine, those on expense accounts. The people I saw reflected Bellevue’s broad demographic. Slim, stilettoed fashionistas and comfort-clad suburbanites gathered around the lounge’s enclosed firepits. In the dining room were silver-haired businessmen, hoodied tech bros, groups of dressed-up gal pals and even couples with very young children. The only suits I noticed were on the staff. 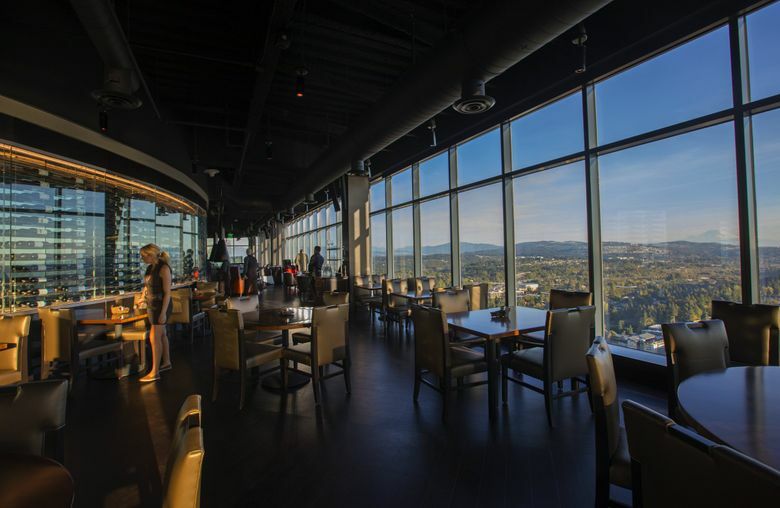 Ascend isn’t your grandad’s idea of a steakhouse, or even your dad’s; possibly it’s not even yours. But a young cohort making big money likely won’t be daunted by $18 cocktails, $30 sushi rolls and steaks that can exceed $100 — or by the pervasive, pulsating techno soundtrack. My 20-something dinner companion, who wore a little black dress for the occasion, said, “I thought this would be like Canlis, but it’s not.” That was meant as a compliment. She could have worn jeans. Hours: dinner 5-10 p.m. Sunday-Thursday, 5-11 p.m. Friday and Saturday; sushi bar and bar/lounge 5-11 p.m. Sunday-Thursday, 5-midnight Friday and Saturday; happy hour 5-7 p.m. and 9-11 p.m. daily. Lunch service begins Oct. 29.